Gyu-Kaku is a unique Japanese BBQ Restaurant offering a variety of quality dishes to be grilled in an upbeat and smoke free environment. Number of Locations: 30 locations in North America. Over 650 locations worldwide. Areas of Operation: US: HI, CA, TX, FL, NY, IL, MA. Looking to Expand into the Following Regions: Washington, DC; Seattle, WA; Portland, OR; Denver, CO; Scottsdale, AZ; Atlanta, GA; Cincinnati, OH; Charlotte, NC; Atlantic City, NJ; Dallas, TX; Austin, TX; Chicago, IL; Toronto, Canada. Winner of the 2007 Hot Concept award, Gyu-Kaku is a "yakiniku" DIY full service restaurant that was originally developed by Reins Japan. Beating McDonald’s and Starbucks as the first to reach 500 units in Japan, the brand grew rapidly. 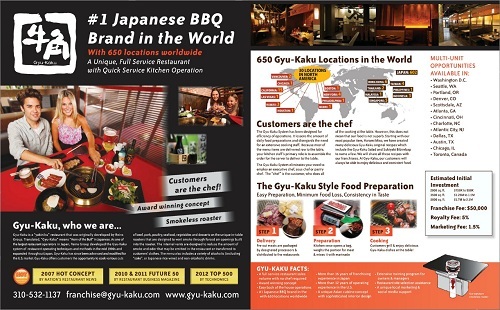 Gyu-Kaku offers customers the opportunity to cook various cuts of meat, vegetables and desserts on the specially designed smokeless in-table roasters. Currently 25 units opened in NY, IL, HI, FL, CA, and TX +5 more under development.